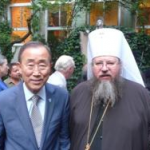 Metropolitan Jonah with UN General Secretary Ban Ki-Moon. 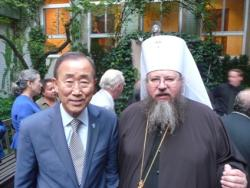 His Beatitude, Metropolitan Jonah, the leader of the Orthodox Church in America, was among the religious leaders invited to attend ceremonies marking the opening of the 66th session of the United Nationsâ€™ General Assembly at the Church of the Holy Family here Monday, September 12, 2011. The ceremony was hosted by the Permanent Observer Mission of the Holy See to the UN and the Roman Catholic Archdiocese of New York. For many years, the Primate of the Orthodox Church in America, as well as representatives of other Orthodox Churches, have attended the annual event. Archbishop Francis A. Chullikatt, Titular Archbishop of Ostra, Apostolic Nuncio, presided at the ceremony. Metropolitan Jonah met and spoke with Mr. Ban Ki-Moon, UN General Secretary, and UN General Assembly President, Mr. Nassir Abdulaziz Al-Nasser. Also attending were Archimandrite Christopher [Calin], Dean of Holy Virgin Protection Cathedral, New York, NY; Protodeacon Joseph Matusiak, Secretary to the Metropolitan, and Mr. Michael Zachariades, Assistant to the Metropolitan.